Forum Index > Historical Arms Talk > How do the Europeans fought with the scabbard on their belt? Posted: Tue 15 Mar, 2005 8:22 am Post subject: How do the Europeans fought with the scabbard on their belt? Never in the fight books do I see they wear the scabbard during the fight. It has become a question for me. Before, I have a sword that comes with a leather scabbard. The scabbard suspend at an altitude lower than my hip and with an angle that facilitate fast drawing speed. Once drawn, the scabbard would become whippy and flexible. It does hinder my fighting movement and I thought with a wooden core scabbard that would not be the case. However, I found it quite the contrary. I have a wooden scabbard with the new sword and once the sword was drawn, again the angle changed with the scabbard's center of mass altered. I moved around and the scabbard ended up almost vertical pointing to the ground. Given the 35" blade length, whenever I bent my knees a bit in any ready stance, the scabbard's chape just tap the ground and the wooden core transmitted the force back to my belt as if telling me "Hey, you can't get any lower". By compare, it seems the leather scabbard was actually less bothering once the sword was out of it because it became very flexible and doesn't thrust to the ground even when it became vertical hanging from the belt. That makes me wonder how do the historical European deal with the scabbard during fighting? I would add to your question what about the sword when used as a secondary weapon? With just one sword to deal with one could leave the scabbard in camp, give it to your squire or page, discard it and retreave if you win the battle. If your primary weapon is a pole arm, a spear or a double handed sword your secondary weapon would have to be in a scabbard or maybe naked blade passed through some sort of ring on your sword belt. Same thing but less ackward with a large dagger or short handled axe or mace passed through the belt. Now there is annoying flopping around that could be ignored and a true hazzard of the scabbarded sword tripping you up or someone else on your side in the close press of a mellee. I would think that this is an old problem as even a Roman legionnaires would have to deal with an empty scabbard on the sword belt! What did they do? You would think that some sort of official rules would have covered this ? What was the usage in the 17th or 18th century ? Good basic question that nobody asks because the focus of interest is mostly with the weapons and armour maybe ? If you look at pictures of armored combatants in battle, the scabbards seem to be held with the tips up high, closer to horizontal than vertical. The historical longsword texts, however, don't describe the scabbard in the context of the duel. Most likely this is because the scabbard would not be worn into the duel. In fact, Talhoffer's armored section shows the combatants carrying both spear and longsword in hand at the same time, and when the spear was discarded, the sword was already ready. This is one of the topics that likely do not have a one sentence answer. Scabbard attachment to the belt varied. Some forms of attachment have the capacity to hold the scabbard at a fixed angle, regardless of whether the swords is in the scabbard. These forms of attachment have at lest two points on different lengths of the scabbard through which they hold it in place (at the right angle). An example of these is the integral belt, virtually ubiquitous until mid 14th century. However, past 1350 a different forms of attachment became popular as well. Many of these hold the scabbard completely vertically. The catch is that these are often depicted on effigies, and may not have been worn during war. As Bill noted, in duels the scabbard was likely not worn at all. In my personal experience, a wooden scabbard with fixed angle works OK.
Another issue worth considering is how much mobility there was in the thick of the line during a melee. I am late for a meeting.....more later. A great deal of just how you wear the sword, and thus the scabbard, depends upon the time, place, and whether or not you are fighting from a mounted or foot position. Some of the early stuff seems indeed to show an almost vertical placement of the sword and scabbard from the belt, as to the much later styles of the 19th and 20 Centuries. But certainly in the 16th Century the sword is worn with a definite rake to the angle, or about 45 degrees. Seems too that the longer the sword (and thus the scabbard) the more likely the scabbard either isn't worn on the person (such as war swords suspended from the saddle) or has easy removal as a part of the suspension system, such as with most of the late-16th to mid-17th Century swords. With those, certainly their extreme length would suggest that wearing the scabbard while in a fight would be less than optimal! Thus, no doubt, the "Quick detatch" features! But for war, you'd tend to want to keep the scabbard handy for when you're done. But there's always that old proverb, "When you draw your sword against your King, throw away the scabbard". I have another point/question to further muddle the topic. Oakeshott refers to a simple metal ring on the belt from which the sword would have been hung naked, especially in battle. I am too lazy to look up the exact reference but I know Oakeshott refers to this so would the more well informed and/or motivated chime in here? From which period would that be? I am curious about when were these used, and how often? There are surviving late 14th c. hooks that were used to suspend the scabbard so that it is easily detachable. I did a brief search about 13th-14c pictures showing battle scenes. In all of them swords were carried in a scabbard suspended on the waist (I am talking about foot soldiers). Even when the sword was drawn, the scabbard remains on the waist. Unfortunately the swords used were single-handers, and were thus shorter than the h&h swords in question. If we were to assume that effigies represent battle attire, there are plenty of examples of h&h swords hung from the waist, many of them vertically. I am not sure whether this is a valid assumption. Thanks everyone for the inputs! I'll try to do some home modification on the suspension system to simulate the historical one. 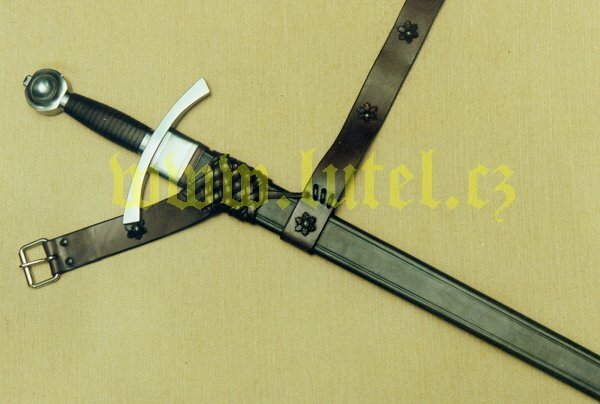 I have quite a bit of experience running around with scabards; I use my Lutel 12017 ( http://www.lutel.cz/obrazky/12017.jpg ) with the Lutel G type suspension as both a primary and secondary weapon for group fighing, and Sword and Buclker duels.